Making cheese is both simple and tricky. Let me show you this easy chèvre recipe, step by step. 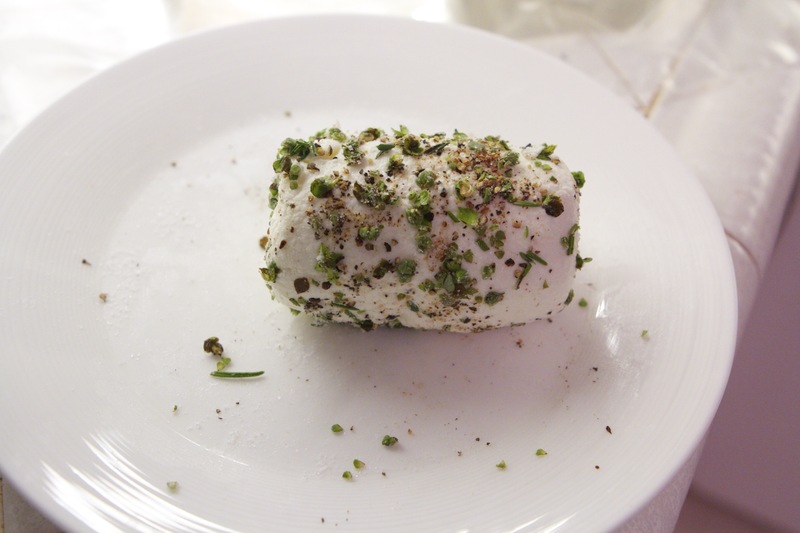 A hand formed log of chèvre rolled in fresh herbs from the garden. And chèvre, the cheese we think of simply as “goat cheese”, is delicious, with a taste that is both true and complex, sweet yet tangy. 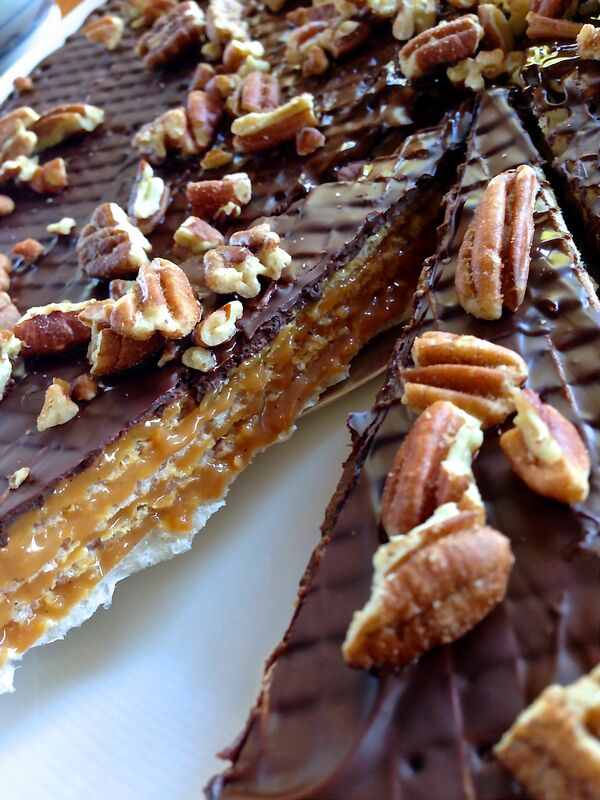 If you haven’t yet tried it freshly made, you are in for a treat! 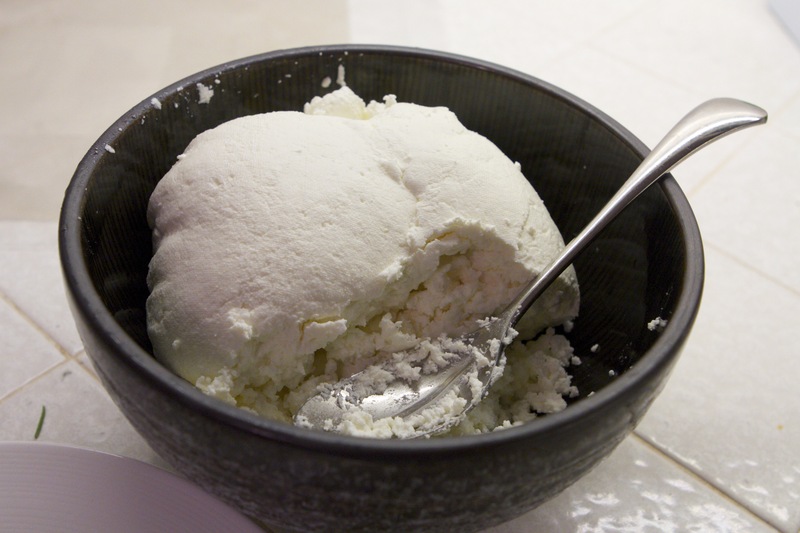 I love cheese, and ever since we have been receiving more goat’s milk than we can drink, I have been experimenting with making fresh cheese at home. I have had some high points, some disappointments, an extremely low point, and have finally managed to get some consistency. I’m excited to finally share what I’ve learned here! This recipe is extremely simple. Just a few ingredients. Follow the technique carefully and you will get excellent results. Although I love to improvise in the kitchen, a word of caution: Even if you drink your milk raw, please consider pasteurizing for the purpose of makingcheese. If you think about it, growing cheese is growing bacteria and you want to make sure that you are only growing the bacterium that you want. 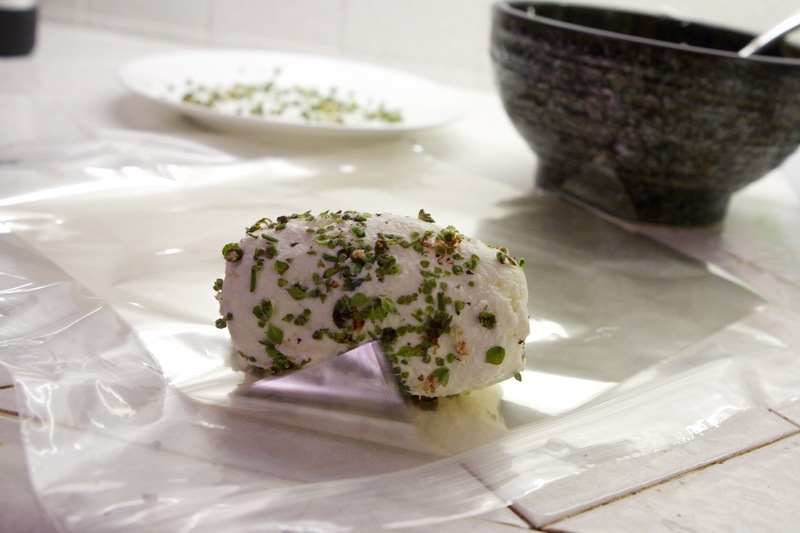 It is also VITAL in cheesemaking to sterilize EVERYTHING that touches the cheese. By sterilize I mean using bleach, not just soap and hot water. Spoons, pots, colander, jars, dishes, etc… My husband and I learned the hard way. 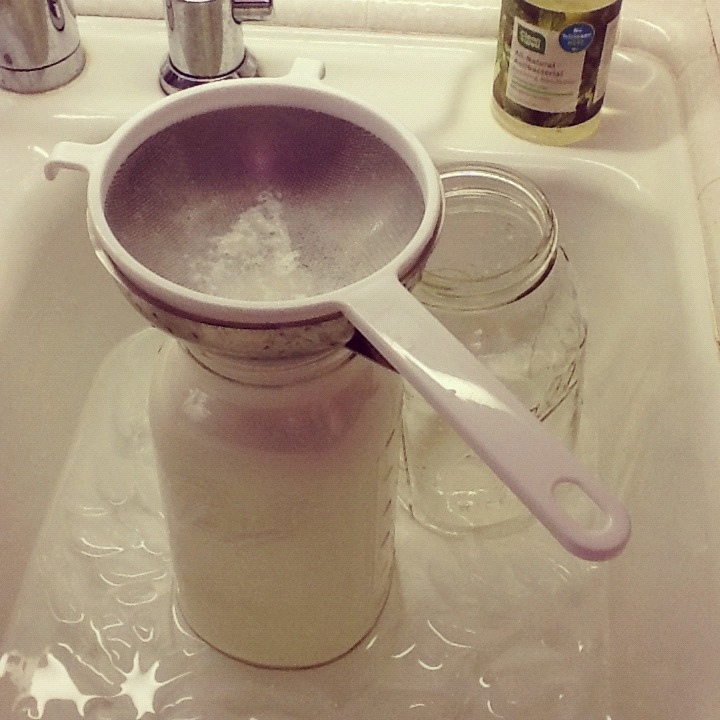 Please check out my first home dairy post on How to Pasteurize Fresh Milk at Home for more of that story and to learn how to make raw milk safe for cheesemaking. Where? Click on any of the links to purchase these supplies through Amazon. Full Disclosure: I make a small commission on any completed purchase made from a link off this site or from our Store. If you are in San Diego, you can also buy all these and more at Curds and Wine. The owner is also very generous with her knowledge and has even helped me troubleshoot a ricotta a that wasn’t setting over the phone. Why special ingredients? My first attempt at cheese was a chèvre recipe I googled that just used lemon juice. Let me tell you, it did NOT work. My second attempt was a ricotta using vinegar. It worked somewhat but it was rubbery and unpleasant to eat straight. Give the real stuff a shot! 1. Sterilize all of your equipment with hot water and a little bleach. 3. Sprinkle a package of chèvre starter over the milk. Let it sit for 2 minutes to rehydrate and then stir it to mix it in. 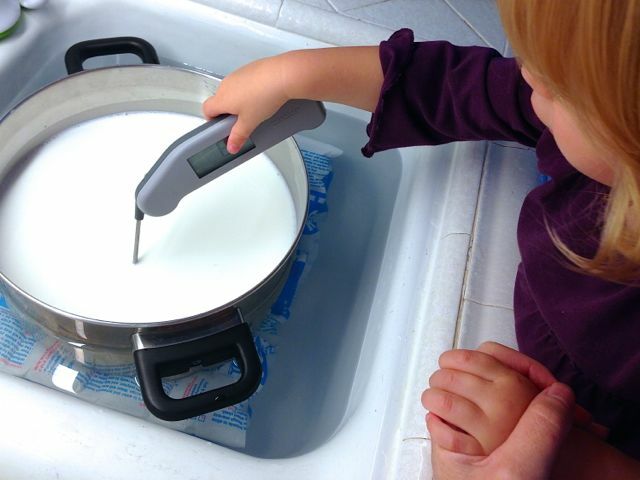 Then let the milk sit at room temperature, or 72° F, for 10-12 hours. (I prefer to do this overnight.) The cheese will be “ready” when a small amount (1/4 inch) of whey has pooled at the top and a knife or spoon inserted into it can make a “clean break” or crevice in the thickened cheese. It will look a little like greek yogurt. 4. Gently ladle all of the curds (the thickened part) and whey (the liquid part) into a colander lined with a double layer of cheese cloth. 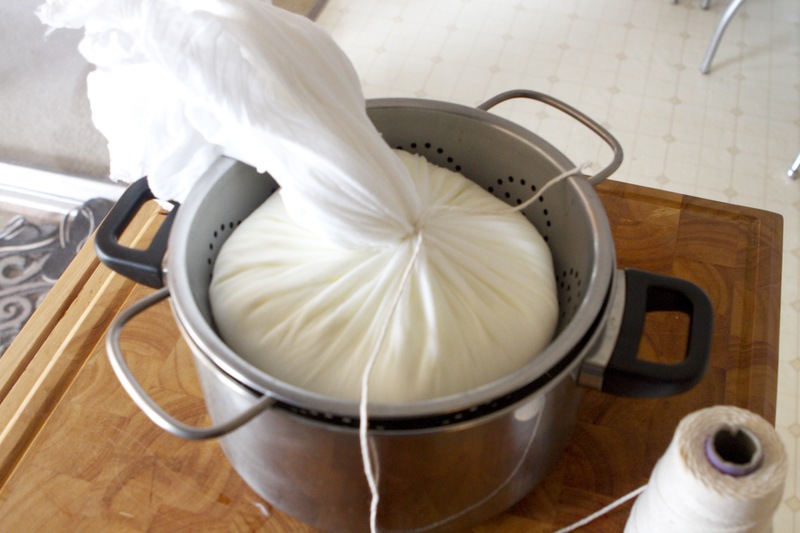 Tie up the cheese cloth with twine and hang so that the whey drips into a large pot or bowl. Let hang for 6-8 hours. 6. Hand form the cheese into logs. Roll each log in cheese salt (or salt that has not been iodized.) You may also put fresh herbs, coarsely ground pepper, truffle salt, dried berries, or another topping on the plate with the salt. Click on any of these images to see them bigger. Gently ladle curds and whey into cheesecloth-lined colander, over a tall pot. 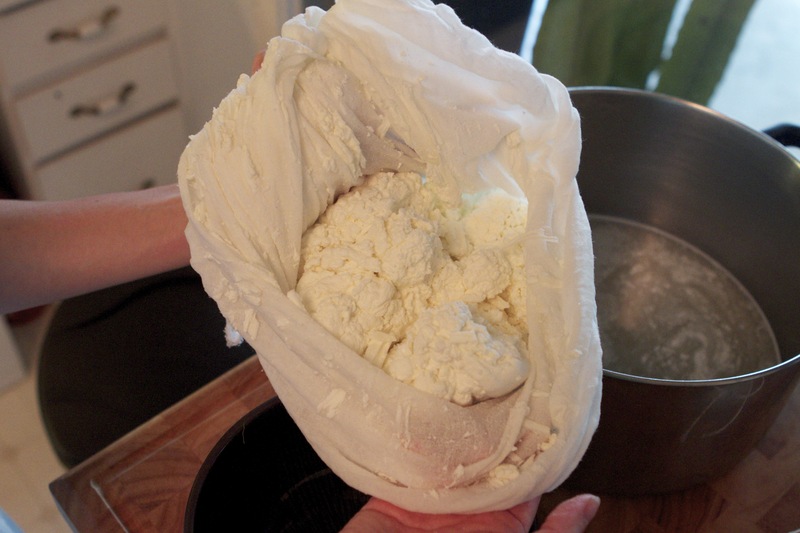 Gently pour all remaining curds and whey into the cheesecloth. Tie up the cheesecloth with cooking twine. Cheese hanging from the pot rack. Gently squeeze out extra moisture to ensure there are no pockets of liquid. Don’t trash the whey! It’s great for the garden. A bowl can temporarily catch the dripping whey. Compost at least the initial whey so it doesn’t smell sitting around. After 6-8 hours, it is ready to cut down. 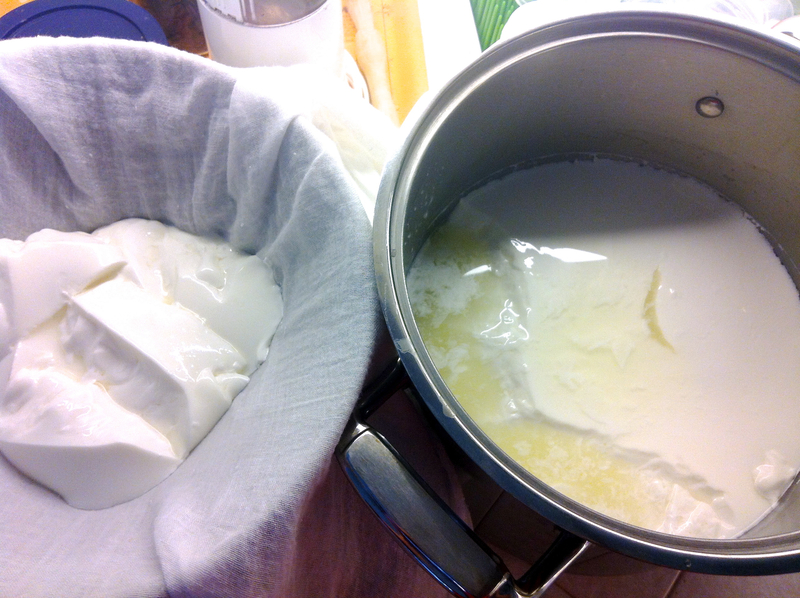 Transfer the fresh cheese to a bowl. Prepare salt and optional ingredients for rolling around the outside of the logs. I reserved 6 oz of cheese for chocolate truffles. Our favorite: black truffle salt. Place log on cheese cellophane and wrap. Fresh goat cheese and chocolate goat cheese truffles. Chèvre produces a relatively large yield of cheese, as opposed to some hard cheeses. 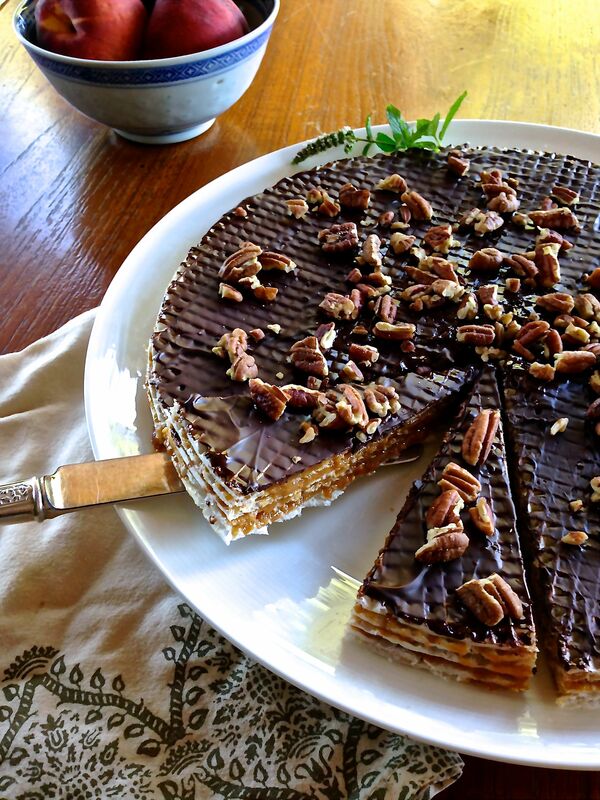 You can easily halve this recipe (using 2 quarts of milk). I got 1.75 pounds of cheese from 1 gallon of milk this last time and have gotten about 1 pound of chèvre from 1/2 gallon of milk. Please let me know if you have any questions. I promise to post the chocolate and goat cheese truffle recipe next! 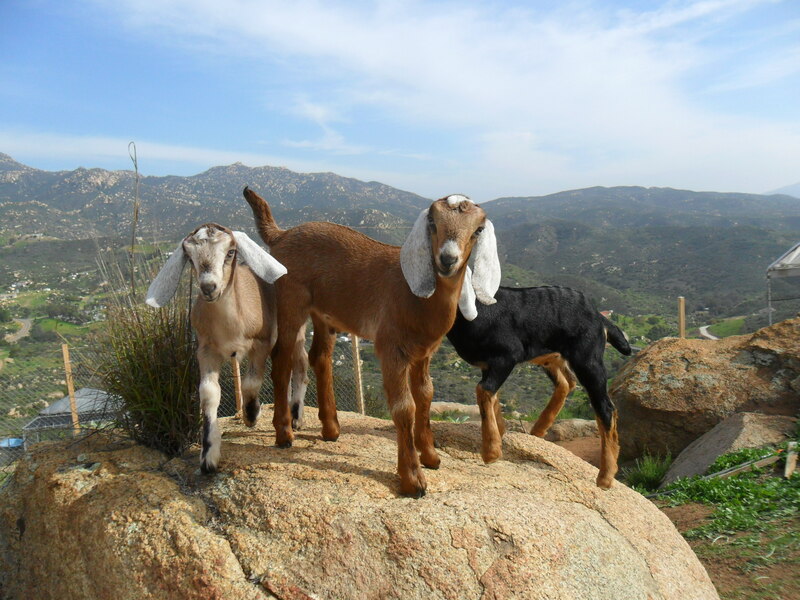 Backyard goats are the new chickens! We don’t actually have goats in our backyard. But we are part owners in a goat co-op. We contributed to the purchase of five dairy goats (four already milking and one yearling) and help pay for their feed and keep each month. They are boarded on a small ranch just east of the city and are fed organic feed and lovingly cared for by our friend and source for all things chicken. 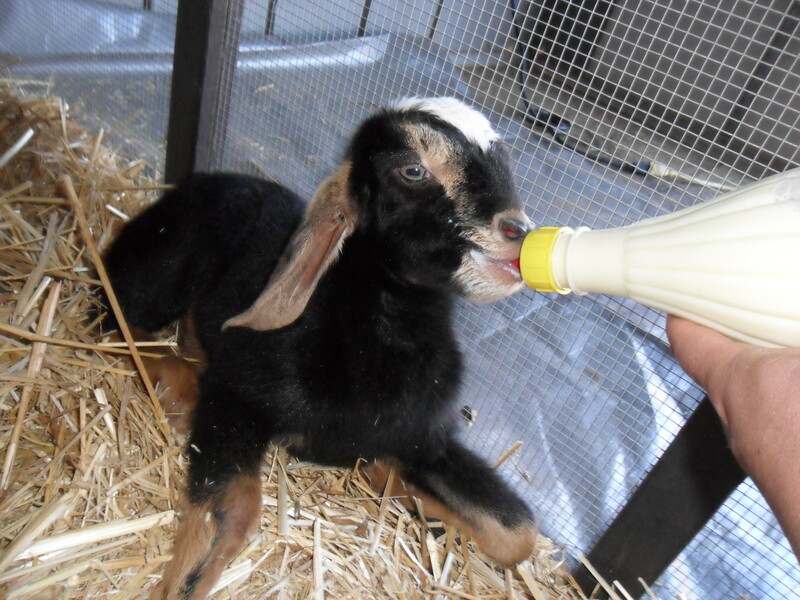 We receive 1-2 gallons of fresh milk each week. I love it when there is a little extra to play with and have so far made various cheeses, kefir and cajeta. (Subscribe to the blog for those recipes which are coming soon.) We haven’t bought any cow, soy, rice, almond or other milk since. 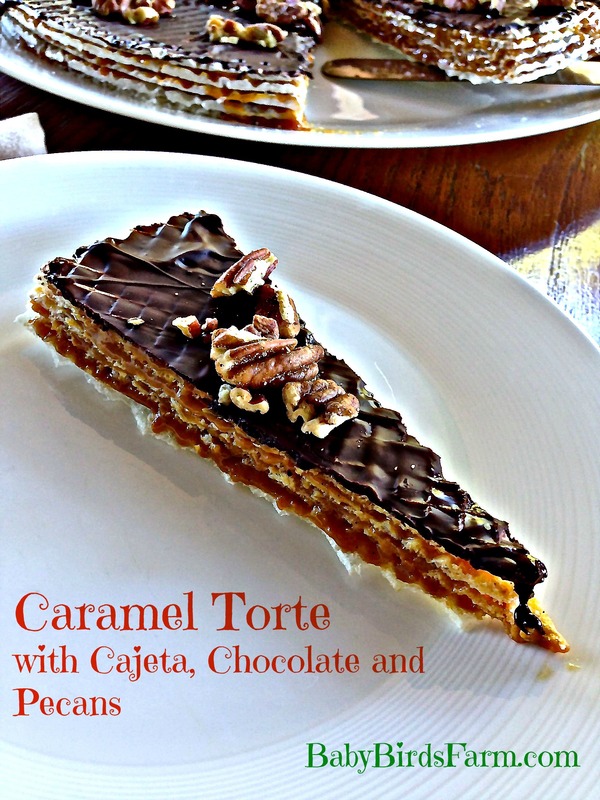 Up until now I have shared primarily recipes that I thought would interest a wide selection of people. I realize that very few people in America need to pasteurize milk at home. The vast majority of milk sold is already pasteurized and those drinking raw milk have likely gone to a great deal of expense and trouble to find it. Raw milk is legal here in California (but heavily monitored and restricted) and it cannot be bought in many states. I wasn’t really intending to get into the whole pros/cons of raw milk… to be honest we never sought it out. We were interested in joining the co-op so that we knew where our milk was coming from. 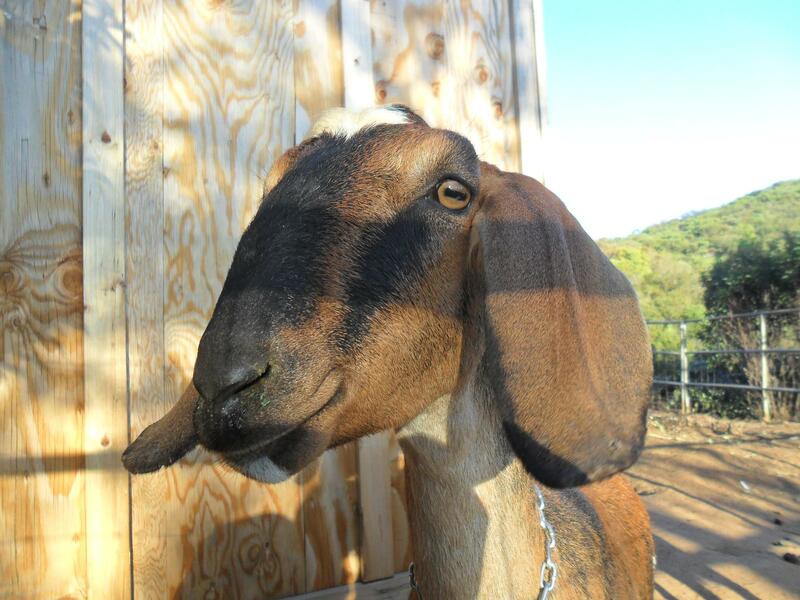 We like that it is from a very small ranch and that we know how the animals are being treated. We are confident that they do not receive hormones or unnecessary antibiotics. We decided to give it a shot. We did not intend to give raw milk to Baby Bird ever, nor would I have wanted to drink it if/when pregnant again. The milk tastes surprisingly good. It tastes less “goaty” then goat milk I have had from the store. And to tell the truth, the raw milk really does taste better…. But… my husband and I were drinking the milk for about four months without issue until one of my cheese recipes required the milk to sit at room temperature for 24 hours. We each had only one bite of the cheese as it tasted really “wrong.” Unfortunately, the 24 hours had encouraged the growth of not only the good cultures but also some yucky bacteria. (In our case, campylobacter.) We were sick, as in drink-the-water-in-Mexico-sick, for two weeks. I am so grateful that our baby never had any. Our milk is handled under safe and sanitary conditions. It could’ve been a fluke that one of our bottles, one time, got one or two little germies, and the cheese making process was perfect conditions for multiplying them to a critical mass. I personally believe now that drinking milk raw was like playing Russian Roulette. <Sigh.> Too bad since it tasted so good. Luckily, there is a very easy fix! Now I err on the safe side and pasteurize all of our milk (including sterilizing bottles and equipment) before drinking it or using it in any dairy making. 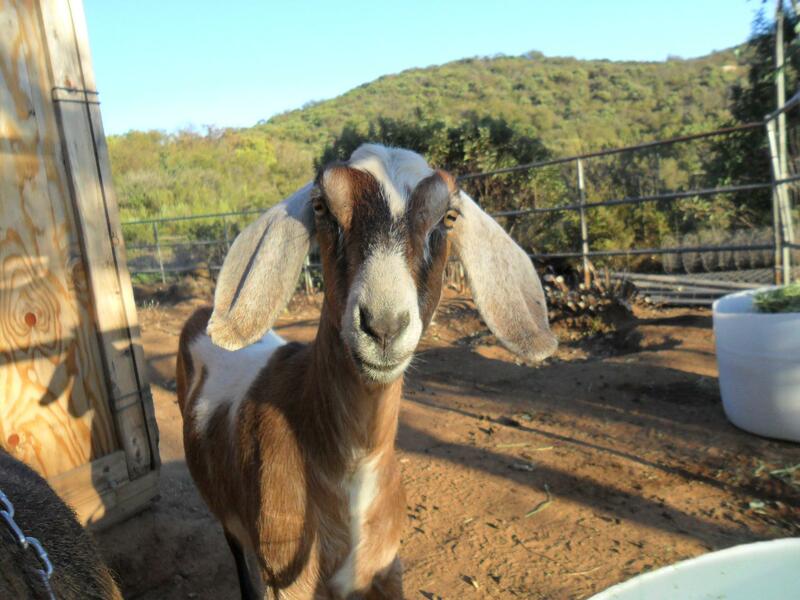 You may get your own goats or purchase some raw milk at a farmer’s market and want to give it to a small child, an adult with an impaired immune system, or make cheese out of it. In the case of 2 or 3 above, there probably won’t be interwebs anymore, so I suggest studying well. You never know when you might need the information. 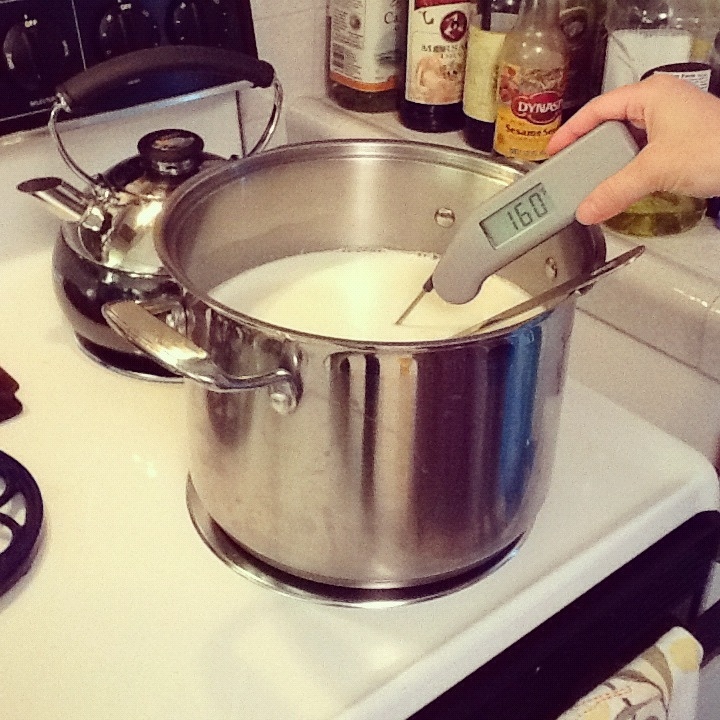 Step 1: In a clean and sterilized, non-reactive pot or double boiler, bring the milk up to temperature. 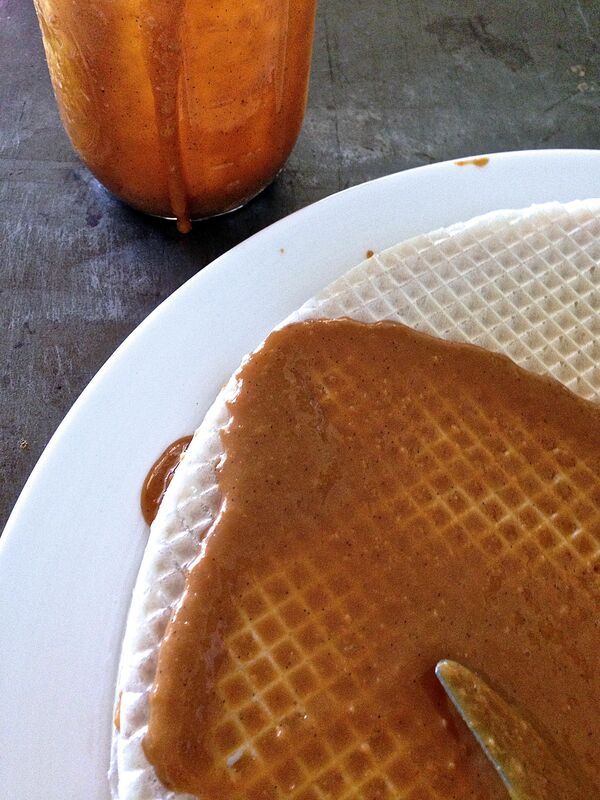 Stir the milk on occasion with a sterilized spoon or spatula so that the bottom doesn’t scorch. 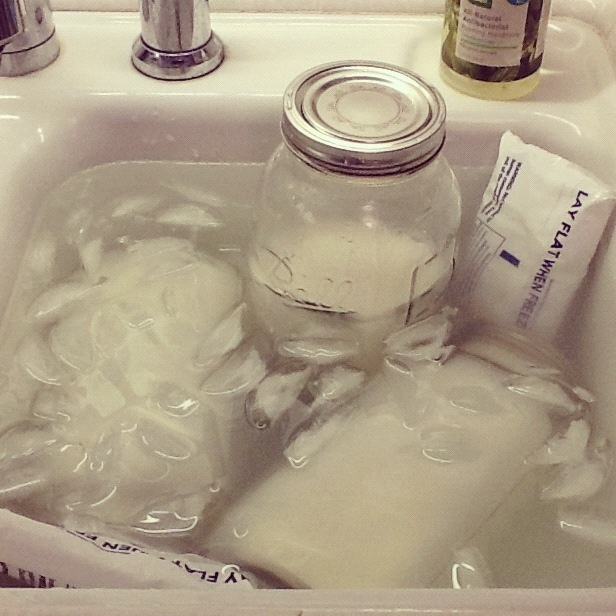 Note: In the picture below, I am pasteurizing 5 quarts of milk. I am not using a double boiler since it wouldn’t fit. I have once pasteurized as little as 1 quart (rushing to work in the morning and needing milk for coffee and cereal) and I used the double boiler. It took less time to pasteurize a quart of milk than it took to make 2 cups of coffee. Step 2: While the milk is heating, clean and sterilize the bottles. I wash them in hot water and then add a teaspoon of bleach. I fill them with hot water up to the brim, seal them with their lids and let them sit for 2 minutes. Rinse very well. 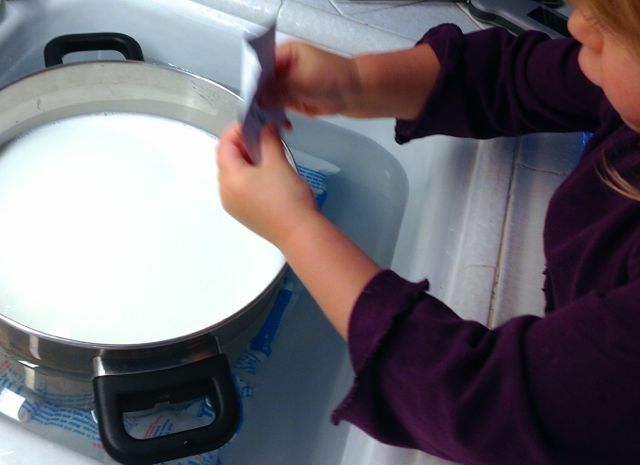 Step 3: Prepare your set up for cooling the milk. The taste will be best if you can cool the milk as quickly as possible once it has been at 161° F for 30 seconds or 140° F for 30 minutes. Water is a better conductor of heat than air, so the bottles will cool fastest in a bath of ice water. For a batch this large, I put a stopper in the smaller, second half of my sink and fill it with ice, ice packs and water. Step 5: Seal the bottles. Submerge them in ice water. Let the bottles cool until they are at least room temperature, then dry them and move them to the refrigerator. Voila! Pasteurized milk is supposed to last longer in the fridge than raw. UPDATE: Please check out our brand new Store for all of the equipment and supplies used in pasteurizing milk and cheese making. Raw milk can be a hot topic, so some thoughts regarding comments: Opinions and information regarding raw milk are okay but please be kind. These are the choices we have made for our family after research and deliberation. Please respect our self determination as well as those of other commenters. My intention is not tell you TO drink milk a certain way, only HOW if you so choose. Thank you!